In this issue we list the arrival of two dozen new restaurants, the expansion of 10 more established businesses into one or more additional locations, and the return to business of two restaurants closed for several months to recover from fires. Against those numbers we note the closing of just 17 restaurants — and several of those locations have already been taken over by the new kids on the block. Is this 2-to-1 ratio of growth sustainable? We already hear rumblings about the difficulty of staffing of new restaurants in general, much less with experienced help. 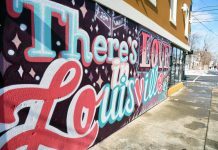 But Louisvillians continue to find dining out an enjoyable entertainment option, and new concepts continue entering the market. As they say, let the good times roll. None of the new entrants to the dining scene are positioning themselves as top tables, but several new businesses are notable for a variety of reasons. Doc’s Cantina has finally opened at 1201 River Rd., just in time for seasonal riverine fun like Thunder over Louisville and the Great Steamboat Race. The boys behind Falls City Hospitality Group (Doc Crow’s, Union Common steakhouse in Nashville) found the overhaul of the former Tumbleweed property more troublesome than first appeared, but the colorful renovations are done and the “Mex-Mex” menu is being served. Veterans of the successful Troll Pub downtown have opened JB’s Pub at 307 Central Ave., conveniently located near Churchill Downs and Papa John’s Stadium, where they will transplant the Troll Pub’s menu to a sports bar theme. Two other veteran restaurateurs have new ideas. Anoosh Shariat will open his family friendly American bistro small-plates focused Noosh Nosh at 4816 Brownsboro Ctr., just behind his Anoosh Bistro. And Steve Clements, who has been off the radar for a while, is back with Finn’s Southern Kitchen, an addition to the eating choices in resurgent Germantown. His new restaurant will serve a Southern-inspired menu for breakfast, lunch and dinner at 1318 McHenry St., just off Goss at the far end of the new Germantown Mill Lofts complex (the former Louisville Antique Mall). Also in Germantown is The Pearl, 1151 Goss Ave., which replaces Pauly’s Schnitzelburg Pub. Downtown will soon see the former Cunningham’s property at 630 S. Fourth St. turned into SET, an American bistro that promises to keep a few familiar Cunningham’s items like the fish sandwich on a modest lunch menu, but set the dinner menu and drink selections a notch or two higher to draw concert-going crowds packing music venues along Fourth St.
Also downtown is a new lunch spot, Hot Box Eatery, opened at 438 W. Market St., and, if you consider Old Louisville to be more or less downtown, the Seafood Lady has parked her food truck and opened a stationary serving spot at 617 W. Oak St. Another food truck, the 502 Café, has also settled down at 1923 S. Fourth St.; owner Chris Williams now runs the 502Café, Smokehouse and Sports Bar, serving barbecue and more on the edge of the U of L campus. In the Highlands, the popular bar, music venue and dance spot Nowhere Bar has remodeled the adjacent space at 1135 Bardstown Rd. into Somewhere Louisville, a bistro-style dining spot. Also on Bardstown Rd. two small regional chains have moved in. Steel City Pops, 1021 Bardstown Rd., offers “gourmet” ice pops in natural fruit flavors. At 1052 Bardstown Rd., Asheville-based The Coffee Zone, is entering the crowded coffee house competition. At various locations around the area we now have Big C’s Lunch and Lounge, serving home-style food at 2319 Brownsboro Rd. ; Recbar offering family-style bar fare and multiple games (arcade-style, pool, Skee-Ball, board games, etc.) at 10301 Taylorsville Rd. in J-town; Main Event Bar & Grill at 12500 Sycamore Station Pl. ; and the vegetarian/vegan deli and bakery Half Peach Café in St. Matthews at 4121 Oechsli Ave. In New Albany, Red Dragon Pub has opened at 145 E. Main St. The rest of the new listings in this issue serve ethnic foods of one kind or another. Taco Steve started serving from a peripatetic food cart around downtown New Albany; now he has an actual kitchen at the back of Destination Booksellers at 604 E. Spring St.
Two other Mexican food purveyors are notable. New Wave Burritos, the late-night munchies provider that had been using various restaurant kitchens after hours, will be delivering now from their own kitchen at 3311 Preston Hwy. (the former location of Grind Burger Kitchen). And Mexa Tacos, 3701 Lexington Rd., limits the menu to steak tacos. Vis a Vis Bar & Grill most recently was Barasti Bar & Grill at 1164 S. Third St. The menu is Middle Eastern/Middle American (falafel, hummus, burgers, fries). Three new Asian restaurants complete our list of two dozen newbies: Asian Wok, adjacent to The Hub and sharing the same address, 2235 Frankfort Ave.; Samurai, a sushi and hibachi grill Japanese place that replaces Fuji, at 12905 Shelbyville Rd. in Middletown; and A Taste of Thai, which is pleasing Crestwood residents at 6549 Hwy. 22. Two intrepid businesses weathered near disasters last year from fire. The St. Matthews location of Momma’s Mustard, Pickles & BBQ took a few months to clean up and rebuild, and has reopened at 102 Bauer Ave. Also in St. Matthews, Silvio’s Italian Restaurant at 104 Fairfax Ave. suffered smoke and water damage from a fire that gutted neighboring businesses. It reopened shortly afterward. Both locally owned businesses and national chains are determined to expand into new locations. Tony Palombino has converted his Boombozz Pizza & Taphouse in Middletown at 13401 Shelbyville Rd. into another Joella’s Hot Chicken restaurant. Wild Eggs has opened another outlet across the river in Clarksville at 1450 Veterans Pkwy. Adrienne & Co. has a new bakery at 133 E. Market St. in New Albany. Danny Mac’s Pizza & Pasta, a Germantown standard, opened a second location at the Mellwood Arts Center, 1836 Mellwood Ave., and The Ville Taqueria has opened a second spot at 3099 Breckenridge Ln. Completing the locally owned expansions, Please & Thank You now has a coffee shop and bake house at 1626 Duncan St. in Portland, and Please & Thank You on the Avenue at 2341 Frankfort Ave.
Three chains have opened new suburban outlets: Panera Bread at 13000 Shelbyville Rd. ; Panda Express at 13311 Shelbyville Rd. ; and Chipotle at 420 S. Hurstbourne Ln. Sadly, three of the 15 closures are concepts begun by the seemingly indefatigable Dustin Staggers. His Creole/Cajun restaurant Roux is still operating, but he has closed Epic Sammich Co. at 2009 Highland Ave. and America. The Diner. at 962 Baxter Ave. And his interesting, popular, but apparently exhausting pop-up dining concept Ten Tables has ended. To the dismay of nostalgic diners, D. Nalley’s, the little place that time forgot, has closed at 970 S. Third St. Le Gallo Rosso’s latest incarnation at the Mellwood Arts Center, 1860 Mellwood Ave., never found traction, and its closure made room for Danny Mac’s Pizza & Pasta. Likewise, the Drunken Chicken, a different concept by J. Gumbo’s, didn’t delight enough U of L eaters, leaving that space (1923 S. Fourth St.) to become 502 Café, Smokehouse and Sports Bar. And as mentioned, Barasti Bar & Grill has closed at 1164 S. Third St, and Vis a Vis Bar & Grill has opened in its place. Two long-lived chains have contracted and eliminated their Louisville presence. Hometown Buffet at 1700 Alliant Ave., and Ryan’s Steakhouse at 5338 Bardstown Rd. are no more. Also closed since the last issue are Fattoush, 2319 Bardstown Rd. ; Crystal Chinese Fast Food Restaurant, 3901 W. Market St.; El Marlin Seafood Restaurant, 1850 S. Hurstbourne Pkwy. ; The Kitchen, 5300 Cane Run Rd. ; Poppy’s Café & Coffee, 4214 Bishop Ln. ; and Yoli’s Cafeteria, 328 W. Woodbourne Ave.